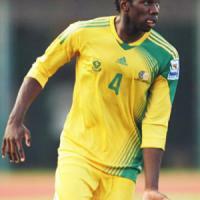 Bongani Khumalo is a South African soccer player who plays as a defender for Supersport United and South Africa. Khumalo will be joining the South-African national team in the world cup this year. Khumalo began scoring crucial goals from set pieces and formed a good defensive partnership with fellow Supersport United players Morgan Gould and Ricardo Katza. All these positive aspects of his game attracted the attention of Joel Santana and earned him a call up to the national side and he has been a regular since. The SuperSport man is a strong player which makes him difficult to beat. He commands his own box with authority and is useful in the opponent’s box. The 23-year old gets the occasional goal from set pieces. He mainly uses his right foot and lacks pace.